BE WHOMEVER YOU WANT TO BE WHEN YOU NEED TO BE SOMEONE ELSE! GREAT FOR UNDERCOVER AND PRETEXT ASSIGNMENTS! I WAS TAKING SOME EXPOSURES OF THAT GIRL IN THAT NEW DRESS BEHIND YOU!" I'M A TREASURE HUNTER AND DO THIS ALL THE TIME." THIS MIGHT BE A GOOD FIND BUT IT'S A LONG SHOT. " Need to do a door-knock and be someone you are not? Need to ask question without stating that you are an investigator? Get caught filming and/or photographing on a surveillance? Need a good excuse to be somewhere without revealing your undercover motives? Some asking questions on trash detail? We have your solution! 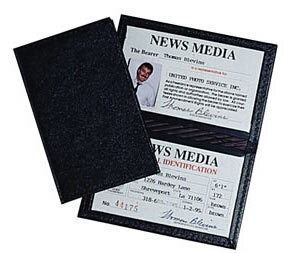 These professional ID laminated systems help you get the pretext job done you came to do and/or get you out of tuff situations so when you leave, a law enforcement officer or investigator was never there. These handy self-laminating ID card systems also make highly professional official ID for your various needs. Misuse Prevention Notice -These Pretext Props Are For Investigators And Law Enforcement To Conduct Undercover And Pretext Assignments. Representing A Known Business Or Person Is A Crime As Well As Misrepresentation Of A Professional Requiring A State License. This Would Include Private Investigator, Bail Bondsman, Security Persons And So Forth. 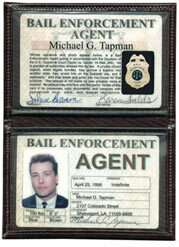 Therefore, Letterhead Authority From Your Law Enforcement, Investigative, Bail Bond And Or Security Agency Is Required. We Do Not Sell These Sets To Private Individuals. In our search for professional ways to carry credentials that meet our specifications for quality and value, we've located several new and useful designs. One of these great new cases is this black Federal case without a badge flap. This case is used most often with our G-series credentials and has quickly become a fast seller. The windows measure 4-inches X 2 1⁄2-inches and this case is guaranteed to give the user years of trouble free service. Order yours today!